Aims: The aim of this study is to improve the knowledge and skills of the elderly how to make herbal mouthwash. Subjects and Methods: The method used in this program was a method of counseling and direct reenactment with individual and group approach using combination method, which was the demonstration of how to make herbal mouthwash. The statistical analysis for this study was using the Statistical Package for the Social Sciences 17 software (SPSS Inc., Chicago, Illinois). Results: The percentage of the mean value of the achievement of elderly cadre about the knowledge of material in herbal mouthwash making was 100%, and the percentage of the mean value of the achievement of elderly cadre about the ability of how to make mouthwash herbal was 93.61%. Conclusions: Based on the results of empowerment, this program was an effective medium for the elderly to be able to maintain and monitor the health of their teeth and mouth. Dental and oral disease is a disease that affects all age groups in children to adults and is no exception in the elderly group. One of the health problems in the elderly is dental caries. Due to the increasing life expectancy of the dentition, older adults are experiencing root caries and gingival recession, putting them at even higher risk for periodontal disease. Root caries is the major cause of tooth loss in older adults, and tooth loss is the most significant oral health-related negative variable of the quality of life for the elderly. From previous epidemiological research reports, it was obtained that elderly data that have a bad social relationship as much as 58.82% of 91 respondents who were examined [Table 1]. 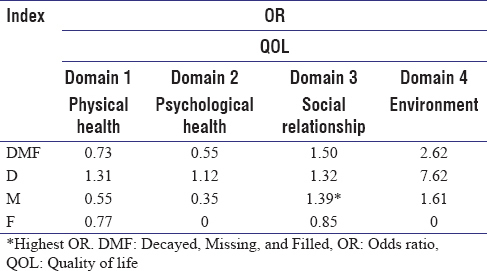 Cross tabulation of the Decayed-Missing-Filled (DMF) index with social relationships indicates that the population with DMF index >13 has a chance of 1.50 times higher in poor social relationships. In addition, the population with D index >3 has a chance of 1.32 times higher of having poor social relationships. From the data obtained, it can be concluded that dental caries affects one's social relationships. People with high caries risk have worse social relationships than those with low caries [Table 1]. Health promotion is meant for the entire population. If a specific group within a population is singled out as the recipient of health promotion interventions, it is because of a valid reason such as epidemiological concerns or preferences in social policy (e.g., measures targeting vulnerable or disadvantaged groups). The elderly have long been neglected as the addressee of health promotion activities. Health promotion targeted to older people differs significantly from that addressing younger generations. This partly stems from the fact that the health of older people is generally less than perfect. Seniors are more likely to be suffering from chronic conditions and multimorbidities, and their functional capacity is frequently limited. To empower the elders to be more concerned about their oral health, a program about cadre learning program about how to manufacture herbal mouthwash was made, and that will be expected to reduce the DMF index and will affect the social relationships of the elderly. Based on the discussion with the dentist from the local Health Centre, it was found that during this time, Health Center that was also dedicated for elderly only did counseling and gave reference for elderly to go to dentist. Therefore, we make innovations in new ways of counseling by using demonstration methods. The empowerment efforts done to monitor dental and oral health in elderly nursing house is by the method of making herbal mouthwashes. Community empowerment is a process to improve the ability or capacity of society in utilizing the resources owned, be it human and natural resources which are available in the environment to improve the welfare of human life. However, efforts are made not only to increase the capacity of the community to meet their needs but also to build a sense of community self-sufficiency to develop and have a strong motivation in participating in the empowerment process., Society, in this case, becomes the perpetrator or center of empowerment process. The aim of this study is to improve the knowledge and skills of the elderly how to make herbal mouthwash. Ethics approval for performing this study has been obtained from the Research Ethics Committee of Faculty of Dentistry Airlangga University, with the number of ethical clearance is 195/KKEPK.FKG/XII/2012. The subject of this research was 12 cadres from 8 nursing houses for elderly in Jagir-Surabaya, East Java. The Jagir district was chosen randomly from 31 subdistricts in the city of Surabaya. This study uses the total sampling method. The method used in this program was the method of counseling and direct reenactment with individual and group approach using combination method that is demonstration of how to make herbal mouthwash. All the respondents who were the subject in this study had filled the informed consent that stated their willingness for intraoral examination and filling questionnaire. The questionnaire used in this study has been tested for its validity. The validity test for the questionnaire is done by finding a correlation between the scores of each question (r result) with the r- value in the table. The validity test is done twice until all questions are considered valid. The results of the validity show all valid questions. The evaluation method used is the observation method with a checklist (attached). After the cadres were given material using the demonstration method, cadres were asked to explain the benefits and how to make herbal mouthwash. The researcher evaluated the cadres to find that cadres were able to explain the benefits and how to make herbal mouthwash correctly with a checklist indicator. After the cadres were declared graduated, cadres were asked to explain the benefits and demonstrate all stages of making herbal mouthwash in front of fellow elderly friends. Next, the researcher evaluates the elderly people who have been taught by cadres with a checklist indicator. At Sari Asih Nursing House, the achievement gained by cadre about socialization ability of how to make herbal mouthwash was 100%, while the achievement of Pramoda Loka Nursing House cadre was 95.83%. At Pertiwi Nursing House, the achievement of cadre regarding the socialization ability of herbal mouthwash making method was 95%, and in Mentari, Nursing House cadre was 87.5%. Health promotion strategies for the elderly generally have three basic aims as follows: maintaining and increasing functional capacity, maintaining or improving self-care, and stimulating one's social network. The idea behind these strategies is to contribute to a longer, independent, and self-sufficient quality of life. It should be noticed that there is an additional objective to be considered: the significance of social participation and integration of the elderly to maintain the quality of life at old age. The observations of the elderly cadres regarding their ability to socialize the method of making herbal mouthwash showed a good results. This can be seen from the results of observations in the elderly who had been given with counseling by the cadre about how to manufacture herbal mouthwash. The way of delivering materials from the cadres to the elderly at Nursing House was quite interesting. There was an A3-sized poster that contained material on how to make a useful herbal mouthwash to facilitate elderly in understanding the material. The poster was given to Nursing House to be affixed. Since the memory of the elderly declined, the media wase expected to be used as a means to remember the material that has been given. The strength of this program is its availability of a new method for making herbal mouthwashes for elderly cadres. Another strength was the delivered information from cadre to elderly in Nursing House which was understandable because of the similarity of the age range. The weakness of this program is that it is difficult for the elderly cadres to accept new methods of making herbal mouthwash. This is because the cadres are familiar with the old method of making herbal mouthwash. In addition, the materials needed for this new method can only be found in certain places. The opportunity that can be used in this program, among others, was that elderly can always remember how to manufacture herbal mouthwash that were distributed and can apply it in daily life. The price of making herbal mouthwash was more economical than nonherbal mouthwash. The threat of this program was that some elderly had a tendency to be lazy to make herbal mouthwashes and prefer a practical mouthwash. According to this study, education in the elderly can be expected to decrease the prevalence of oral disease. Based on the results of empowerment, this program was an effective medium for the elderly to be able to maintain and monitor the health of their teeth and mouth. Elderly can find out how to maintain oral health and making herbal mouthwash themselves. For example, elderly can demonstrate how to make herbal mouthwash that can improve the quality of life affected by oral health. Ambar TS. Partnerships and Empowerment Models. Yogyakarta: Graha Ilmu Kartasasmita; 2004. Tonetti MS, Bottenberg P, Conrads G, Eickholz P, Heasman P, Huysmans MC, et al. Dental caries and periodontal diseases in the ageing population: Call to action to protect and enhance oral health and well-being as an essential component of healthy ageing – Consensus report of group 4 of the joint EFP/ORCA workshop on the boundaries between caries and periodontal diseases. J Clin Periodontol 2017;44 Suppl 18:S135-44. Frost R, Belk C, Jovicic A, Ricciardi F, Kharicha K, Gardner B, et al. Health promotion interventions for community-dwelling older people with mild or pre-frailty: A systematic review and meta-analysis. BMC Geriatr 2017;17:157. Sowa A, Tobiasz-Adamczyk B, Topór-Mądry R, Golinowska S. Health status of older people – Evidence in Europe. Zeszy Nauk Ochrony Zdrowia Zdrowie Publiczne Zarządzanie 2015:4. Espeland MA, Crimmins EM, Grossardt BR, Crandall JP, Gelfond JA, Harris TB, et al. Clinical trials targeting aging and age-related multimorbidity. J Gerontol A Biol Sci Med Sci 2017;72:355-61. Budiharto. Introduction to Health Behavior Sciences and Dental Health Education. Jakarta: EGC; 2009. Ermawati T, Sari DS, Yuliana MD. Efforts to Improve Dental and Oral Health in the Elderly. Faculty of Dentistry, University of Jember; 2014. Ginanjar K. Community Empowerment: The Concept of Development that Is Rooted in Society. Surabaya; 2007. Republic of Indonesia Ministry of Health. Handbook for Community Dental Health Cadre Training. Jakarta: Republic of Indonesia Ministry of Health; 2012. Slamet Y. Community Development with Insight on Participation. Surakarta: Sebelas Maret University Press; 2004. Sumodiningrat G. Realizing Nation Welfare: Overcoming Poverty with the Principles of Community Empowerment. Jakarta: PT. Alex Media Komputindo; 2009. Heavey EE, Baxter CR, Birks YF. Financial advice for funding later life care: A scoping review of evidence from England. J Long Term Care 2018;30:3-6. Lindström B. Workshop salutogenesis and the future of health promotion and public health. Scand J Public Health 2018;46:94-8. World Health Organization. World Report on Ageing and Health. WHO Publications; 2015. Seeman TE. Social ties and health: The benefits of social integration. Ann Epidemiol 1996;6:442-51.